Posting Pathrado was my long time dream. Clicking the step wise pictures was hooked in my mind when I went to India. Pathrado was made several times during my stay and to my bad luck I was unable to capture the pictures for some reasons. It so happened that once there was no charge in my camera, the other time I was busy with something else and one more time I was lazy:-) So I was sad that I will not be able to post it. But luckily my brother clicked beautiful stepwise pictures of Pathrado from his wonderful camera. I am thankful to him, his camera and my mother as well. Now for the masala: Drain the water in which the rice is soaked and then grind the soaked rice along with grated coconut, roasted red chilli, tamarind and salt. Use minimum amount of water while grinding. The masala should be a thick, fine paste. Transfer it to a bowl and then add asafoetida and mix well. Masala is ready. Now comes the assembling part. Assembling has to be done very carefully. A rough idea of what we are going to do is- we will make two rolls of the pathra leaves and each roll contains approximately 5-7 leaves. The leaves in each roll are smeared with the prepared masala and then stacked one upon the other. Am I confusing? No worries:-) We will start in detail. So how many leaves did I put on it? My mother says- if the leaves are big then you can stop at 5. If the leaves are small then you can continue till 8. Hope everything is clear till now. Now next comes the rolling part (have to be little more careful). This is how it looks at the end. We made two rolls. You have to be really careful after rolling. The rolls should not open up. If you are not confident of handling then secure it by tying a thread around it ( my mother is experienced and hence doesn't do this). Next comes the steaming part. There are two options. You can either steam the whole rolls as it is (as my MIL does) or cut it into 8-9 pieces (as my mother does). 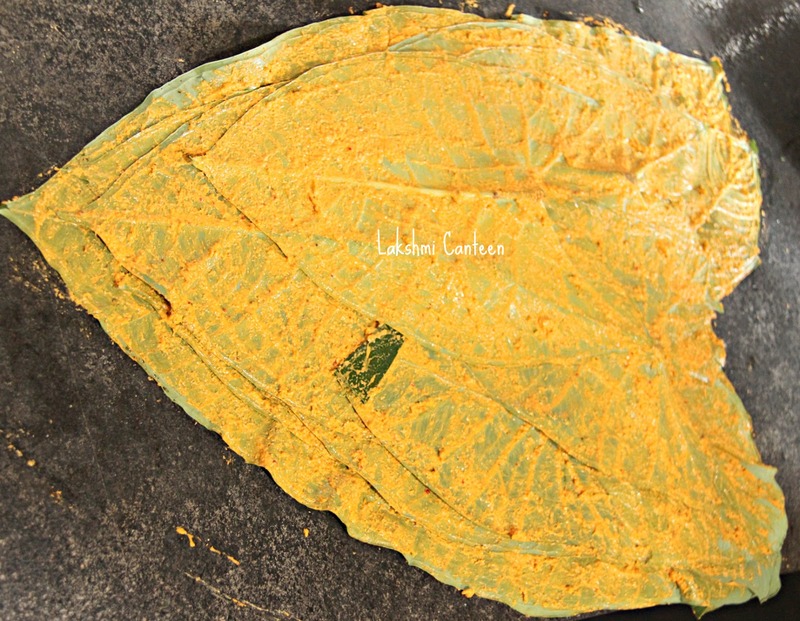 Steaming it whole is an easy method when compared to cutting it (The only drawback of cutting is there are chances of the leaves falling apart and hence has to be done with extreme care). Choose the method which you are comfortable. We sliced and piled it in a steamer. A closer view of a single piece. Now steam it for 25-30 minutes. After steaming it looks like this. What are you waiting for? Pathrado is ready!! Serve it hot with generous amount of coconut oil on it. You can serve it as a side dish to rice and any curry of your choice. Above measurement serves 4-5 people. Rice and green gram are to be soaked together for 7-8 hours. Rest of the procedure remains the same. 2. The thick ribs preset on the backside of the leaf has to be removed with a knife. Care should be taken not to tear the leaf while doing so. 3. Some leaves give a itching sensation while eating. To prevent that, give a coating of tamarind water or diluted vinegar on the back side of the leaves atleast an hour before assembling the pathrado. yummm! my mom's recipe is same your mom's...pictures are beautiful!